Perfect for helping a toddlers to use utensils and helping with accidental spills. Impossible to move unless lifting from the corners. A child could pull this up at the corners, too, but that's what discipline is for. Easy to clean. thought I ordered the bowl with 3 sections. Returned this bowl after ordering and receiving the correct one. This was purchased as a gift, it looks as it would be ideal for a young child. I bought 4 bowls for my 3 grandsons all under one year old. I kept one for Grandma's house :) They work great as long as it is on a flat surface. The mat was too big for the high chair tray and the edge gave just enough wiggle room to be moved. The mat is a very thick rubber and very sturdy. I think it is great to roll up and put in the diaper bag. We are taking the mats to Disneyland next month. Got this for my granddaughter who is 14months. Everyone should buy this! She is unable to drop this on the ground. Where were you when I was raising two boys. BEST BOWL FOR KIDS AND PUPS! Who knew??? Finally a bowl that works for two species! My grandchildren love this bowl and it is also the perfect bowl for little slobber puppies! Thanks for this great invention that makes us all happier, cleaner and better! Both my 1 and 2 year old grandchildren have used this bowl and it is wonderful. If you have a child that likes to dump out their food here is your answer! I had to laugh cause the 1 year old thinks it is funny to dump his food and now he can't! Great idea, use it all the time! The EZPZ Happy Bowl is so versatile for snacks on the "go" around the house. It fits securely on any surface and is small enough for most high chairs, tables, coffee tables, stools, anywhere you need it. Good for solids and liquids alike. High quality silicone and thick/sturdy. Nothing cheap about this amazing invention!! I have been a follower of the company since they were just in Kickstarter and have purchased many Happy Mats, Happy Bowls, and now the Mini Mat that just got released. All are amazing!! Go Lindsey, keep up the awesome work, great customer service, and attention to detail!! My husband got the bowl and plate mats for our two-year old daughter who has Down syndrome. She just recently graduated from a tube-weaning program in May, but prior to that she was tube-fed since birth. As a new eater AND being an independent two year old, she wants to feed herself, but does not quite have the dexterity to load her spoon. Once loaded she can get it into her mouth, but the loading is the problem. Our mats arrived, and we immediately tested out the bowl version with oatmeal. She was able to load her spoon far more effectively than she has ever been since her bowl stayed firmly in place, and her Daddy and I love the mat portion. Yes, there was a mess since she had both hands in the bowl, but it was minimized a great deal by the mat. We tested both mats on multiple surfaces in our home - wood table, Corian counter, tile, and tray table of high chair. They did not budge on any surface! These are a winner and I just did a video and recommendation for my other special needs mom friends. We belong to a huge network of several hundred other parents, and quite a few of them are placing their orders today. Annabel was extremely happy that she was feeding herself, and we are happy that she is gaining more independence as an eater. After using these, I would consider them a must-have item for all parents. Do note that the divided plate mat is larger than the bowl mat, and may not fit on a highchair tray table. Ours barely fits and the edges hang off, so the mat might not be as non-slip as it would if all corners were able to lay flat. However, we can easily adjust the height of her highchair and use the mat at our kitchen table, so it's not a big deal for us. Absolutely love these! 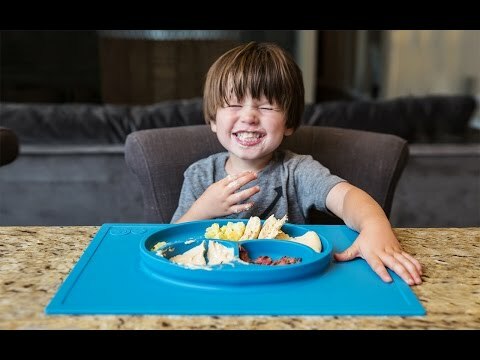 The Happy Mat makes kids’ mealtime less messy and less stressful, with an all-in-one plate and placemat and an all-in-one bowl and placemat. The fact that these solutions were invented by a mother of three young boys almost goes without saying. That mom, Lindsay Laurain, was tired of chaotic, food-flung dinners. She created a large silicone placemat with an integrated three-section plate. It suctions onto a counter or table, so there’s nothing to slide around and no upset dishes. Any mess your little eaters make is more likely to end up on the mat, which rolls up easily afterward. Each Happy Mat is dishwasher safe, so cleaning is a snap. And if your kid takes a while to eat, the Happy Mat goes right in the microwave. It’s FDA-approved, made with a 100% safe silicone. It stores easily, and doesn’t leave marks on surfaces, so it’s great on plane trips. You can use it for craft time, too.